Hair loss is one of the more dreaded side effect of chemotherapy for cancer, but not all chemotherapy drugs have the same effect. Some medications almost always result in hair loss, whereas others cause minimal hair loss. We will look at the particular drugs most likely to cause hair loss (alopecia), but there are other factors that can affect hair loss as well, such as the dose of the drug, the timing of administration, and the combination of drugs you receive. Fortunately, there are options available to help people cope with this symptom, ranging from a wide array of hats, wigs, and scarves, to the relatively recent approach of using cooling to attempt to prevent hair loss partially or completely. In addition to chemotherapy, some targeted therapies and hormonal therapies for cancer can cause hair changes as well, such as thinning, curling, and dryness. Hair loss is very common during chemotherapy for breast cancer as well as other cancers, though some drugs and methods of administration are more likely than others to disrupt hair follicles. Chemotherapy drugs work systemically (throughout the body) by interfering with the division and growth of rapidly growing cells. While these drugs can be effective in eliminating cancer cells, they also damage normal cells in our bodies which divide rapidly. This includes hair follicles (leading to hair loss), cells in the digestive tract (leading to nausea and vomiting), and cells in your bone marrow (leading to fewer red blood cells, white blood cells, and platelets). Hair loss often begins around the time of your second chemotherapy infusion, though this varies widely. It may start slowly, but increases rapidly around 1 month to 2 months after starting treatment. Some people do not lose all of their hair until they have nearly completed chemotherapy. Hair re-growth typically begins within 3 months of concluding chemotherapy. When your hair does grow back, many people find they have what's been coined chemo curls. If your hair was straight prior to chemotherapy it will likely become straight again, but this process can take up to several years. The good news is that chemotherapy-induced hair loss is almost always temporary and reversible, though there have been a few rare exceptions. 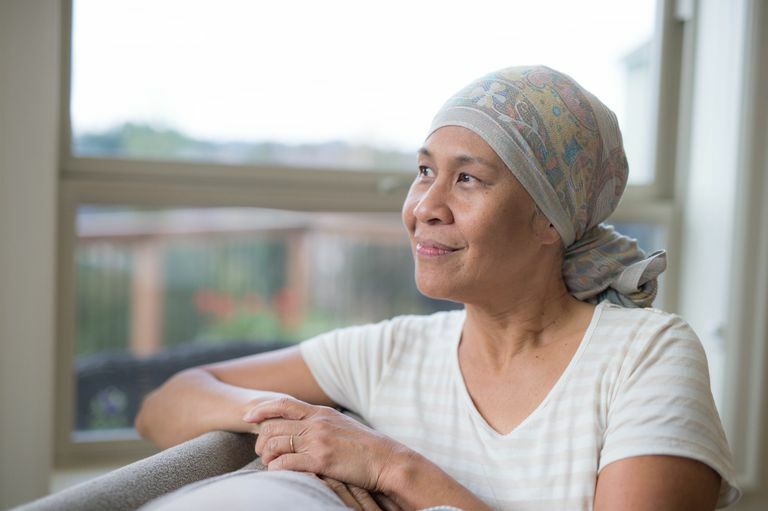 Some women with breast cancer have developed permanent hair loss following a combination of taxanes (such as Taxol or Taxotere) and hormonal therapy, though this is rare. There have also been a few reported cases of permanent and severe hair loss in women with breast cancer who have received a combination of FEC (fluorouracil/epirubicin/cyclophosphamide) with docetaxel. Some techniques have been tried to prevent or reduce hair loss (see below). There are a number of chemotherapy agents used in breast cancer—many of them used in combination. Common regimens for adjuvant treatment such as Cytoxan and Adriamycin followed by Taxol are usually associated with hair loss. The newer targeted therapies for cancer don't usually cause total hair loss like chemotherapy drugs, but can result in changes such as thinning of the hair and dryness, as well as changes in texture similar to the chemo curls noted above. Some targeted therapies may also affect the pigmentation of hair, often causing the hair to become darker. There are a number of non-cancer related medications that are associated with hair loss, that might accentuate the effects of chemotherapy drugs if used in combination. Some of these include retinoids (such as Accutane), anti-thyroid medications, L-Dopa (levodopa), amphetamines, non-steroidal anti-inflammatory medications, and several antidepressants such as tricyclic antidepressants and Wellbutrin (bupropion). In addition to medications, illness, surgery, or dietary changes (low protein diets or very low calorie diets) may lead to hair loss. Thyroid disease (either hypothyroidism or hyperthyroidism) may cause hair loss, and may occur with cancer treatment (such as chemotherapy-induced hyperthyroidism or hypothyroidism which is very common with immunotherapy). For those who are interested, it may sometimes be possible to prevent hair loss from chemotherapy. Scalp cooling units can reduce roughly 50 percent of hair loss, but comes with a price. Many infusion centers do not have these units and therefore you may have to rent a cooling device, and depending on the device, this can be fairly pricey. Scalp cooling (referred to as scalp cryotherapy) works by narrowing the blood vessels in the scalp so that chemotherapy drugs are less able to reach hair follicles. With some cancers, especially blood-related cancers like leukemia and lymphomas, there has been concern that cooling could reduce the effectiveness of chemotherapy. While it's not likely to be a problem with breast cancer, scalp cooling can be very uncomfortable, similar to the symptoms of brain freeze you may remember while eating ice cream in the past. Medications such as Rogaine (minoxidil) have also been tried, but are not very effective in reducing hair loss. It can be very emotional coping with the hair loss you experience during chemotherapy. Even though this complication is more of a nuisance, it remains one of the most feared side effects. Many oncologists recommend that you purchase a wig, hats, or scarves before beginning chemotherapy. All or a portion of the cost of a wig may be covered by your insurance. To have it covered, however, you will need to have your oncologist write a prescription for a "hair prosthesis." Before you go, you may want to check out the basics for buying a chemotherapy wig. There are also organizations that provide free wigs, hats, or scarves for people living with cancer. It's important to keep in mind that hair loss may occur all over your body. This includes eyelashes, eyebrows, pubic hair, and more. While women may appreciate a reprieve from shaving their legs (and men, their faces), our eyelashes perform a protective function you may not realize until you open an oven door or are outside on a dusty day. Check out these 6 ways to prepare for hair loss from chemotherapy. Many chemotherapy drugs result in hair loss, including those used for breast cancer. Some people choose scalp cooling as a way to reduce hair loss whereas others prefer the comfort of a warm head and planning ahead with a scarf or wig. The preference is very personal and it's important that you do what is best for you alone. Fortunately, most hair loss is temporary and many women find that their hair grows back even healthier than before. Dunnill, C., Al-Tameemi, W., Collett, A., Haslam, I., and N. Georgopoulos. A Clinical and Biological Guide for Understanding Chemotherapy-Induced Alopecia and Its Prevention. Oncologist. 2017 Sep 26. (Epub ahead of print). Kluger, N., Jacot, W., Frouin, E. et al. Permanent Scalp Alopecia Related to Breast Cancer Chemotherapy by Sequential Fluorouracil/Epirubicin/Cyclophosphamide (FEC) and Docetaxel: A Prospective Study of 20 Patients. Annals of Oncology. 2012. 23(11):2879-84. Nangia, J., Wang, T., Osborne, C. et al. Effect of a Scalp Cooling Device on Alopecia in Women Undergoing Chemotherapy for Breast Cancer: The SCALP Randomized Clinical Trial. JAMA. 2017. 317(6):596-605. West, H. Chemotherapy-Induced Hair Loss (Alopecia). JAMA Oncology. 2017. 3(8):1147. Fonia, A., Cota, C., Setterfield, J. et al. Permanent Alopecia in Patients with Breast Cancer After Taxane Chemotherapy and Adjuvant Hormonal Therapy: Clinicopathologic Findings in a Cohort of 10 Patients. Journal of the American Academy of Dermatology. 2017. 76(5):948-957.